Launched in 2005, Slots Village Casino has quickly emerged as a fun, safe and reliable place to gamble online. Slots Village is owned by the Winward Casino Gaming group, and as is the case with its older sister Winward Casino, it runs on Parlay Entertainment Software. Slots Village's graphics won't overly impress you, but the casino compensates for its underwhelming visuals by offering more games than almost any other online casino. In addition to its tremendous game variety, Slots Village also provides its players with a consistent helping of generous promotions. So if you’re looking for a Parlay casino with plenty of promotions and bonuses, Slots Village Casino is the place for you! Slots Village Casino, by far one of the best Parlay casinos, gives all new players a 200% match bonus on their first deposit worth up to $1,000 free! Upon signing up and depositing at Slots Village Casino, your bonus will be automatically added to your player account. In order to cash in on the bonus, players must wager twenty times the amount of their initial deposit, a very fair figure considering the amount of money the casino is giving away to its new players. If you're the type of player that's not prepared to make a deposit without sampling the merchandise first, you’ll definitely want to check out Slots Village. For a limited time, Slots Village will give all new players $15 free for simply opening a player account! The $15 is yours to keep, and any winnings that you make from it are yours too! In addition to the sign up bonus and the free money bonus, the casino also gives its players a special birthday present in the form of $25 free! Simply send the casino proof of your date of birth in the form of identification, and it will fund your player account with $25! For information on all of Slots Village's outstanding player promotions and loyalty programs, visit Slots Village Casino today! Slots Village Casino features over 200 exciting casino games, including a massive selection of table games, video poker games and slots games. Slots Village's table and specialty game library includes: Craps, Blackjack, Keno, Table Poker, Baccarat, Roulette, and more; video poker titles include Joker Poker, Jacks or Better, Deuces Wild, and Deuces and Joker. As its name would suggest, Slots Village specializes in slot machines, and its lineup of slots games will leave you blown away. Popular Slots Village titles include: Fire and Ice, Lucky 7's, Hollywood Reels, Diamond Surprise, Get Cracking, Double Scoop Delight, Flaming Fortune and Wild Cherry. This Parlay casino has more games than virtually any other online casino, so take our word for you, you won’t ever be bored playing online casino games at Slots Village Casino! Slots Village Casino accepts players from all over the world, including Americans. 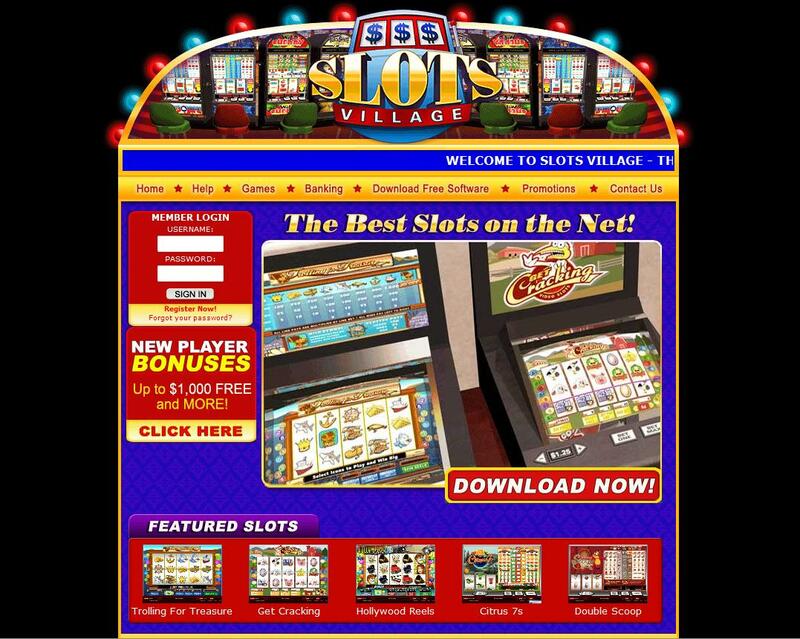 Download Slots Village software right now for free, or play their Parlay casino games in your browser window using Flash technology. If you like Slots Village Casino, you may also like WinWard Casino, which is also powered by Parlay Entertainment.